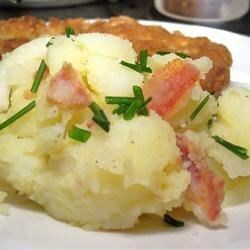 "This potato, bacon and onion salad actually tastes better the second day when it's reheated." I tried this and it turn out good. I tried as is for the kids but they didn't even care for it.I still like my german mother inlaws version. potatoes, onion, bacon and vinager. I make this in much smaller batches for our small family, and I use equal amounts of white sugar and light brown sugar.